Bella has lived a rather boring life, but that all quickly changes. A new position in school forces her to take charge. A new boyfriend (her first), Jeremiah, hands her a confidence she has never known before. A new role in her church’s Fall Production makes her a leader. But that all gets destroyed when an attack by her father’s enemy turns her into the center of attention. Bella believes things couldn’t get worse, but they do. Can she survive the road of destruction and emerge stronger? Or has all that she gained been destroyed forever? Bella pulled a couple of books out of her locker. What was her first class again? She hadn’t gotten much sleep the night before. The nightmare had returned. Why had it started up again? She hadn’t dreamt of that day months. It had to be the stress. Yesterday the tutoring requests had begun to come in, more than she could have anticipated for the first day of school. There was so much organization required. She had meant to come in early and do some work on it, but she was so tired. And her parents hadn’t helped. All they talked about was how it would look on college applications. Graduation was still two long years away. College wasn’t even a top priority at the moment. Surviving her junior year was the most important thing. Her brain was clogged like a hair-filled pipe. Not even Drano could unclog this mess. “Look what the cat dragged in.” Heather jeered and paused behind Bella. Heather’s tag-alongs took up a spot on either side of Bella. The three girls effectively cornered Bella against her locker. Bella peered at Missy Watkins, a prickly blonde witch who was also on the cheerleading squad, and then turned back to her books. Yes, she had agreed to deal with their insults, but it would be on her time. “You’re right about the clothes. And she does smell a little like mothballs.” Heather waved a hand in front of her face as if she were attempting to fan fumes away. “I bet it’s the clothes that smell. They’re probably hand-me-downs from her grandmother.” Cassie Shows giggled; she was an uptight redhead, a third wheel in their little group and the only one not a cheerleader. She just had money. They had been tethered together from the moment the three of them met. They normally poked fun at her clothes, so this wasn’t unusual behavior. She hadn’t worn anything different today than she had the day before. A dark denim skirt, a short-sleeve turquoise button-up trimmed with lace, and brown flats. Like always her hair was braided and hung down her back. Bella dug around in her locker. What was she looking for? “You know, with all these rags, I’m really curious what your brother sees in her.” Missy crossed her arms and popped a hip out. “Don’t even try it, Heather. You’re nothing but tainted sludge. I suggest you get used to the gutter. It’s where you belong.” Bella shoved the three girls aside as if they were annoying flies. She hadn’t even noticed that a small crowd of students had gathered nearby, who clapped as she broke through. Her cheeks flushed with heat. With another deep breath, she made her way through the assembled students. Several patted her on the shoulder and others offered congratulations. An arm hooked into hers and she jumped. Alex, it was just Alex. A breath escaped her lips and her temperature started to come down. At the age of 16, Krys Fenner fell in love with Psychology and Creative Writing. At that time she wrote her first short story dealing with sexual abuse and forgiveness. Psychological issues in her family filled her with the desire to help others using her own experiences. So in 2004, she earned an Associate of Arts in Psychology. And while her sister is the one with dreams of becoming a Psychologist, Krys Fenner returned to Creative Writing. She is currently working on a Bachelor of Arts and plans to continue on to a Masters degree, where she can major in her first love (Creative Writing) and minor in her second (Psychology). 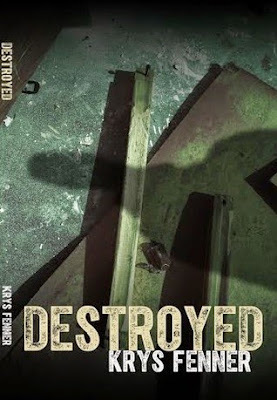 3 Grand Prize Giveaways: Each includes books from other authors, signed copy of Destroyed, plus swag.